The antihero Parker first appeared in 1962 as the star of Donald Westlake (writing under the pseudonym Richard Stark)'s novel The Hunter . Parker eventually went on to star in 23 more books before Westlake's death in 2008 and has been depicted on screen a few times before, perhaps most notably in John Boorman's POINT BLANK (1967). 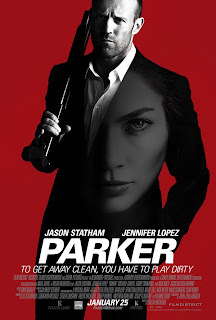 Now veteran Hollywood director Taylor Hackford (AN OFFICER AND A GENTLEMAN, THE DEVIL'S ADVOCATE, RAY) has decided to try his hand at the character in PARKER, a film based on one of the later books in the series that stars Jason Statham as the titular criminal with a code. The set-up is great, and although I have not read this particular book in the series, it's very much in keeping with what I have read of Parker's adventures. Once again the cooly professional badman finds himself working on a heist (at the Ohio State Fair) with accomplices who are far less reliable. First, the most erratic member of the gang botches a planned diversion leading to the death of an innocent, something that goes against Parker's principals. Then, once they have the money, the gang tells Parker they need the whole take as seed money for another heist. Parker can either join in with them, or die. Parker decides he doesn't much like those options, and after barely escaping from his former partners with his life, he tracks them to Palm Beach where they plan to make their big score. It is at this point Jennifer Lopez enters the film and completely undermines the tone that has thus far been established. J-Lo plays Leslie, a plucky, down-on-her-luck divorced real estate agent living with her cantankerous soap opera addict mom and a yappy little dog. Where everyone else seems to realize they're in a gritty crime/action film, it feels like Leslie has beamed in from a wacky caper film, with Lopez giving an overly broad performance that apparently intended as comic relief. Concurrent with Leslie's introduction, Parker adopts a ridiculous disguise involving a bad Texas accent and a really big hat. Parker meets Leslie while gathering intelligence about recently purchased houses and a phony romance angle gets forced on the two leads. Parker may be a bad guy, but it always seems pretty clear that he takes his relationship with long-term girlfriend Claire (Emma Booth) seriously and has no intention of cheating on her. Nonetheless, the film half-heartedly engages in banal “will they or won't they” nonsense with Parker and Leslie that we never buy for a second. Although the trailer makes it look like this is yet another non-stop fight fest for Statham, that's not quite the case. There should be more than enough violence to satisfy Statham's regular fans, but this is more of a noir/crime film than a straight up actioner. Director Hackford hasn't really done this kind of action film before, but he acquits himself well with the fight scenes and stunts, and he gets so much about the film right that it's obvious he has a genuine respect for Westlake's creation. The problems that arise from Ms. Lopez' presence in the cast, however, show how crucial it is to pick an actor who is right for the role rather than looking at marquee value alone. Given that Statham has pretty much made his career playing variations on the Parker archetype, this should have been a perfect vehicle for him, one that is a little more grown-up than the B-grade fare he usually stars in. And yet because of the tonal dissonance, PARKER winds up being no better overall than your average TRANSPORTER sequel. It's not without entertainment value, but it could and should have been better. 2 1/2 out of 4 stars.